As the temperature goes up, you’ll find yourself dehydrated quicker than before if you’re not careful, but water can quickly become unappealing. 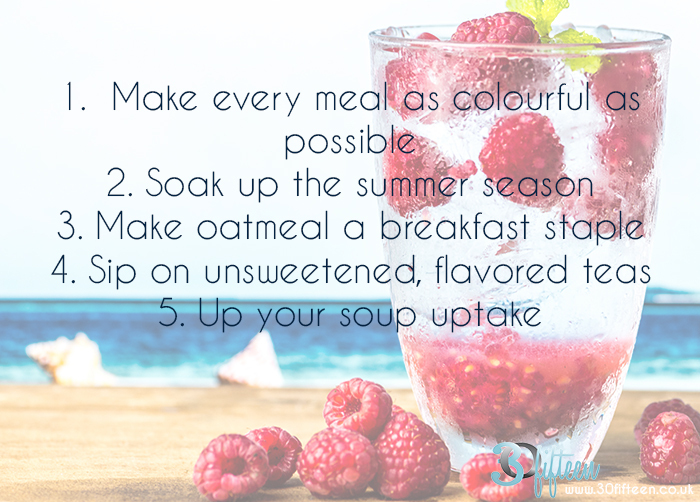 So, here’s some ways you can stay hydrated without having to drink even more water! Fill half your plate with fruit and vegetables, they are packed full of water. Vegetables and fruits with the highest water content include celery, cucumber tomatoes, melon, and oranges. Between June and August, watermelon is the freshest and least expensive, so we recommend you buy it in bulk. Packed full of fluid, it’s super hydrating! This one is a classic. Not only is it hearty and filling, oatmeal is also very hydrating. They absorb the fluid they are cooked in, or soaked in. Broth-based soups or gazpacho are a fab idea when hunger strikes. Served cold, gazpacho won’t make you break a sweat during the summer, but will still hydrate you just as well. Blend cucumbers, bell peppers, tomatoes, onions, and garlic cloves for this satisfying soup.